… or is it just serving old wine in a new bottle? Rajasthan Royals, under the sprightly looking Shane Warne posted a daunting looking total of 160 for the Knights to chase. It was never going to be an easy task given the fact that the Royals were a major threat on their homeground. But thanks to a well paced 80* by Kallis and a speedy 75* (44 balls) by skipper Gambhir, and an all time IPL record 2nd wicket stand of 152 between them, the Knights cantered home with 9 wickets and balls to spare. A major walloping, if there ever was one! 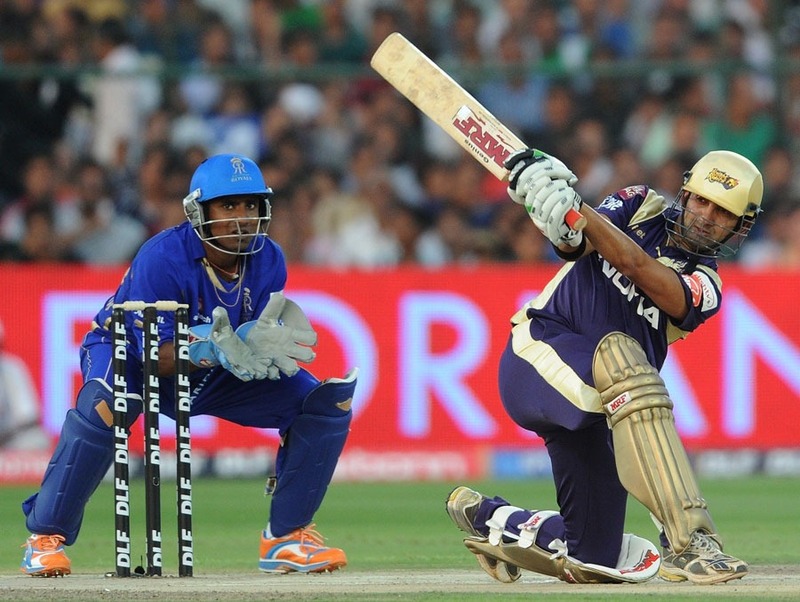 The Royals were on the back foot right from the start when Gambhir called the toss right. With a weak bowling, and a much stronger batting, the ideal thing to do was to chase. RR got it wrong straight away when they did not send in Watson, who has been in scintillating form, cracking a 185* recently against Bangladesh. In quite a poetic turn of events, the Bangla skipper, Shakib, was the one to get him today. The fact that Shakib castled Watson with one that turned and bounced a bit after being deposited for a massive slog-swept sixer bears testimony of the fact that the guy’s got it in him! The fact that Ross Taylor could not repeat the pyrotechnics that send Shoaib Akhtar crashing and burning in the World Cup was a relief for KKR. Though Balaji bowled his medium pace well, the fact that he can be dispatched twice in an over, way over the head of mid wicket is a worrisome thing. Especially since Brett Lee, who has been in great form for the Aussies did not fire at all. Although his first two overs were decent, he went for a few at the death. Another thing that makes absolutely no sense for the KKR is to open with Bisla. The fact that he ran himself out early on in the innings is one of the things that paved the way for an early entry by Gambhir, and the result was there for everyone to see. And so, this brings me back to my earlier argument that gambhir should open the innings with Kallis, and Bisla should make way for Sreevats. Agreed, Sree isn’t made in the Dhoni/Gilly mode and is far from a free flowing stroke-maker, but then again, neither is Bisla! As for Kallis, forgive me for saying this, but he appears to be doing the job that Ganguly was doing last three years. Only difference is that this time around the Manoj Tiwaris and Gautam Gambhirs are taking care of tonking the ball. Don’t get me wrong, I am not undermining the effect of having Kallis in the team. And the contributions he has made in all the 3 matches is astounding. 3 haalf centuries on the trot in T20s is not a matter of joke! But at the end of the day, he is scoring pretty much with a strike rate of about 120-125, something which Ganguly did with decent regularity himself. Another player that I rank highly based on his experience and exploits in the County, Australian and South African T20 circuits is Ryan ten Doeschate. Clearly, the KKR management does not seem to have the same amount of faith in him, choosing as they are Eoin Morgan ahead of him. I hope the fact that Tendo actually hails from a minnow nation (Netherlands) is not coming in the way of his selection. His inclusion would mean that the team would have an extra bowling option. Granted, he is not the best of all rounders around, but given how anemic the KKR bowling is, an extra option would never hurt. The team looks balanced, they are fielding well, the top order is firing. The middle order has not had much of a hit, and how they respond in a crunch situation remains to be seen. The first match fiasco against Dhoni’s devils can be overlooked, because, well, that was the first match and Gambhir was probably off his rocker to come in at number six. That apart, the concern how they fire under duress remains to be seen. Another player whose inclusion baffles me is Rajat Bhatia. In my opinion, his place in the side can easily be taken by Lakshmi Ratan Shukla, who happens to be an excellent fielder besides being a more than handy, hard hitting, medium pace bowling all rounder. The KKR chase was made easier by the fact that the RR don’t really have a great bowling attack on the days Shane Warne fails to weave his magic. Much has been said about Nayan Doshi, the son of legendary left armer Dilip Doshi, but he fails to impress me at least in this match. In fact, Shakib has been more impressive for me than Doshi. Which brings me to another topic: if Shakib is in the playing XI, he will bowl his quota of 4 overs. In that case, what is the role of Iqbal Abdullah? He is a fine young spinner, I agree, but should he not make way for a different kind of a bowler? Maybe the leg spinner Ladda? I missed KKR’s first match bowling and so I am not exactly aware of his skills, but inclusion of a leggie instead of two similar lefties seems like a more logical recourse. Tags: Cricket, IPL, KKR, PostADay2011. Bookmark the permalink.